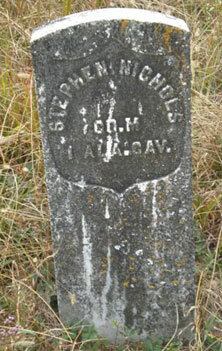 Stephen H. Nichols lived at Booneville, MS from 1865-1892 and at Wilsonville, Cocke Co., TN from 1892-1893. He died August 22, 1935 in Ripley Co., MI. He was the son of James R. Nichols, a Mexican War pensioner who lived at Lawrence Co., AL and Prentiss Co., MS. Stephen was the grandson of William Nichols, a Revolutionary War pensioner from Montgomery Co., NC where he was born in 1765 and married Elizabeth Trent on October 4, 1800. He then moved to Lincoln Co., TN and on to Lawrence Co., AL where he died May 16, 1838. His widow then married Robert Barrett who died December 24, 1850. Picture submitted by John Thompson.